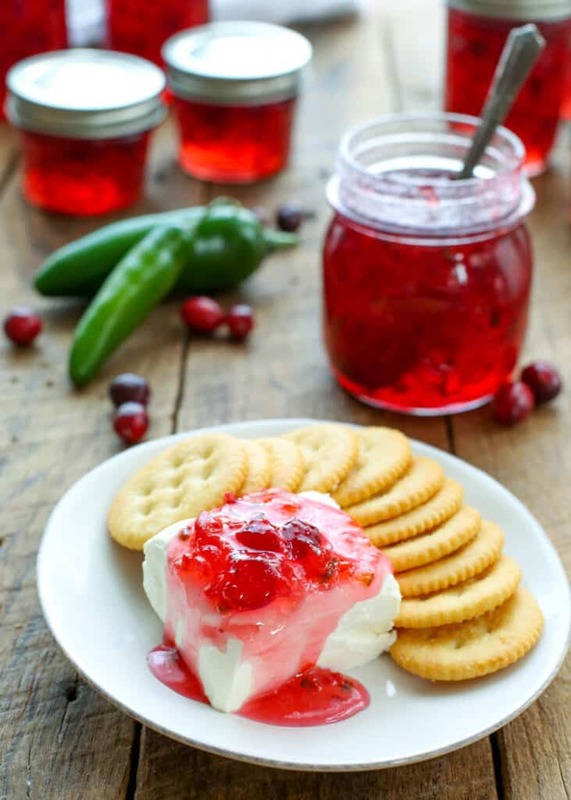 Tart cranberries and spicy peppers mingle in this sweet and spicy Cranberry Pepper Jam. 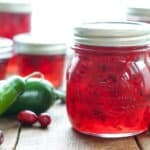 When I realized I’ve been buying Cranberry Pepper Jam almost every time I’m at the grocery store, I knew it was time to make my own version of this jam. I first tried the jam with brie and fancy wafer crackers. Then I poured the jam over a simple block of cream cheese and served it with Ritz crackers. My kids went nuts over that. Next, I spread the jam on the Best Ever Ham Sandwich. When you layer this Cranberry Pepper Jam with creamy goat cheese, salty ham, and fresh arugula, it’s the sandwich that everyone is going to be talking about. 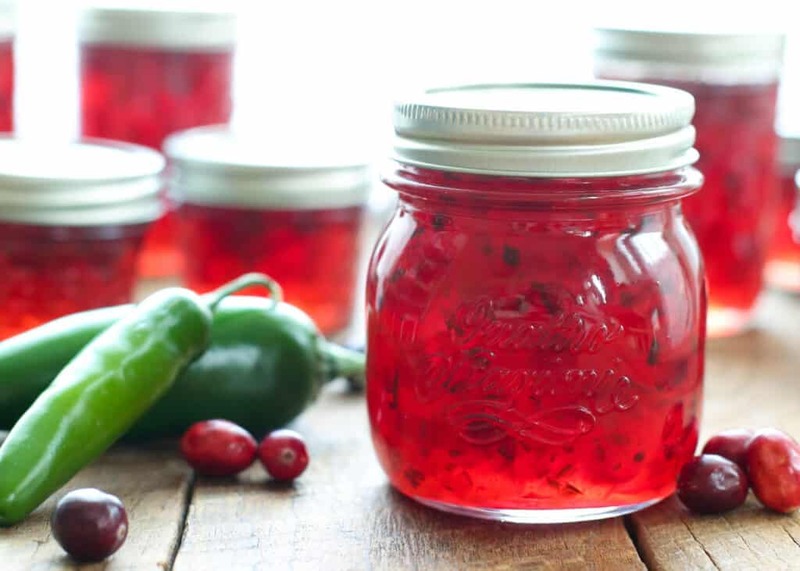 I don’t think I’ve ever mentioned an upcoming recipe that has been as highly anticipated as this Cranberry Pepper Jam. I mentioned that I would soon be sharing the jam recipe when I first shared the sandwich recipe a couple weeks ago. In the time since, I’ve received countless emails, messages, and snaps asking when I’ll be sharing the recipe for the jam. 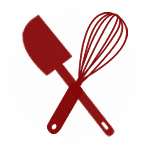 So, I’ll apologize now for the delay, because the recipe just wasn’t perfect until now. And it is absolutely positively PERFECT now. You may notice two unusual additions to this recipe; calcium water and Pomona’s Universal Pectin. The calcium water comes in the box along with the Pomona’s, so you don’t have to worry about purchasing them separately. Because I feel rather strongly about how spectacular Pomona’s pectin is among all others, I’m going to give you a somewhat detailed explanation why it is that I am recommending this particular pectin product. Pomona’s Universal Pectin, unlike most other commercial counterparts, does not contain any weird preservatives or fillers. Pomona’s, unlike most other commercial pectins, allows you creative license to scale up or down any recipe to your heart’s content. If you scale up other pectins, the jams or preserves almost inevitably fail. Pomona’s lasts forever and has no expiration date as long as it is properly stored. Pomona’s may seem more expensive if you just compare the box vs. box prices, but with the Pomona’s you can make between 3 and 5 batches of your favorite jam and with the major brand pectin, you get one batch per box. That makes Pomona’s comparable in all cases and cheaper in most. *huge thanks to Rebecca Lindamood for her extensive help while developing recipes using Pomona’s and her willingness to share that knowledge so freely. Notes on the use of Pomona’s are very lightly adapted from her words here. Kitchen Tip: I use this pot, this pectin, these jars and these jars when making this recipe. Combine the cranberries, bell peppers, jalapenos, serranos, and vinegar in a large deep pot. Bring to a boil over high heat. While the mixture comes to a boil, shake together the calcium water according to the package directions. In a small bowl, stir together 1 cup of sugar and 1 tablespoon of Pomona's pectin. Allow the mixture to boil for 1 minute and then remove from the heat. Remove from the heat and pour into sterile jars. Process in a hot water bath and then store in a cool dark place for up to a year. Alternatively, this jam may be stored in the refrigerator until ready to use. The jam will keep in the refrigerator for up to a month or alternatively, you can freeze it for up to 6 months. Enjoy! You may notice two unusual additions to the recipe; calcium water and Pomona's Universal Pectin. The calcium water comes in the box along with the Pomona’s, so you don’t have to worry about purchasing them separately. I’ll break down for you why it is that I am highly recommending this particular pectin product. Pomona's Universal Pectin, unlike most other commercial counterparts, does not contain any weird preservatives or fillers. Pomona’s, unlike most other commercial pectins, allows you creative license to scale up or down any recipe to your heart’s content. If you scale up other pectins, the jams or preserves almost inevitably fail. Pomona’s also allows you to make low/no sugar jams, jellies, and preserves with the same product should you wish to do so. If you want to use a grocery store pectin, you’ll need to buy a separate, specialized kind of pectin for that. Pomona’s lasts forever and has no expiration date as long as it is properly stored. Pomona’s may seem more expensive if you just compare the box vs. box prices, but with the Pomona’s you can make between 3 and 5 batches of your favorite jam and with the major brand pectin, you get one batch per box. That makes Pomona’s comparable in all cases and cheaper in most. *huge thanks to Rebecca Lindamood for her extensive help while developing recipes using Pomona's and her willingness to share that knowledge so freely. Notes on use of Pomona's are gently adapted from her words here.